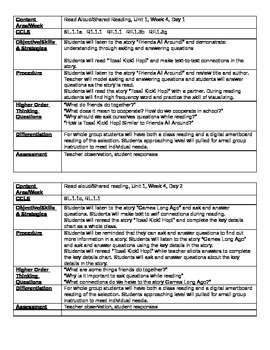 This file includes Unit 1 daily lesson plans for the Read Aloud/ Shared Reading portion of the McGraw Hill reader Wonders for First Grade broken down into sections such as objectives, higher order thinking questions, differentiation, CCLS, and assessment. The file is editable to meet your needs. Please check a preview of the file to see how it is broken down. 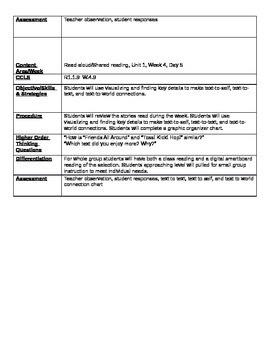 Unit 1 weeks 1,2,3,4 and 5, plans for each of the 5 days of the week.